Exciting times for the Kitsilano Band Program! The music department had an eventful day last week as a few prospective instruments were brought in from Tapestry music for students to “test drive”. Two more are coming next week. The department wishes to keep them all but may need to narrow our selection to three. 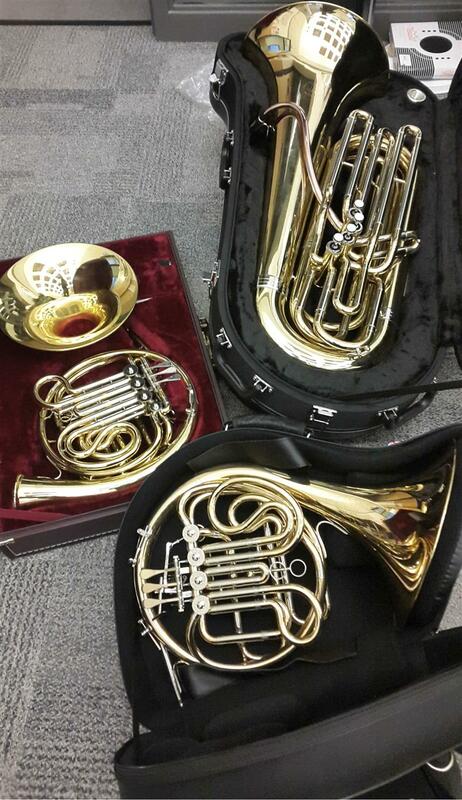 We are hoping we can adopt at least one or two to add to our much needed low brass inventory. Which instrument is your favourite? Please see the photo! Orchestra for their 100 Day anniversary celebrations! past student performances and upcoming events. Hello, my name is Pauline Lo, the current music teacher at Kitsilano Secondary. The Kits Music program is undergoing a rebuilding phase and we are looking forward to moving into the new building. As your children go through their course planning, consider encouraging them to take up music as one (or both!) of their electives. Studies have shown that the benefits of learning to sing or play a musical instrument translate well into both academic and social settings. In addition, making music in an ensemble has been proven to be an excellent stress reliever, a break from the pace of our world. Beginner Band 8/9/10/11 – no experience necessary! 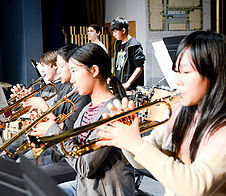 Concert Band 8/9/10/11/12 – for all instrumentalists with more than one year of ensemble experience. We are currently looking into doing a short trip with the band next year. Choir 9/10/11/12 – all levels welcome, creative arrangements will be tailored to the level of the singers. Pianists will also have the opportunity to play with the choir. There a possibility of adding Jazz band as a before school class. Students interested in this option should contact Ms.Lo an expression of interest ASAP. All Jazz Band students will need to enroll concurrently in Concert Band. Additional information can be found on pg.36 of the course planning guide. The hope is that by building a strong foundation the next couple of years we will generate sufficient interest to add on more music offerings in the senior grades in years to come. A note to current beginning band parents: the second year of playing is crucial to instrumental success later on. Please encourage your student to continue on their instrument, or even switch instruments. This second year builds the technique required to play the exciting and impactful pieces of the Senior years. Student trips (e.g. Whistler, Seattle) not just to travel but to play!